Complete A Licence To Perform Dogging In Brisbane. Major Training Group delivers high quality, reliable training solutions that will prepare you for the highest standards of high risk onsite safety and compliance. To work alongside crane operators and truck drivers, as a labourer or construction site worker you need a Dogman ticket –Major Training Group QLD will make it happen. Major Training Group has a depth of knowledge that only comes from a family owned business with a history of providing plant and transport services to major infrastructure projects; coupled with some of the best trainers in the industry. For your first or next move in the construction industry in QLD or beyond, major training group will make it happen. Upon successful completion of the dogging course, you will be issued with a dogman ticket allowing you to work in a variety of industries. We offer our training programs across QLD in Brisbane, Sunshine Coast and beyond. A Dogman or Dogging ticket with Major Training Group is a nationally recognised qualification that will get you site ready for a range of crane operator roles that involve (for example) selecting the lifting gear and estimating load weight. 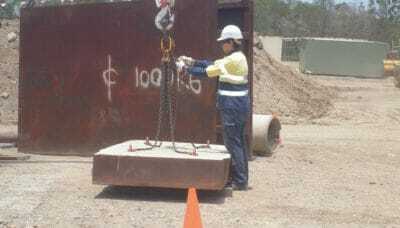 If you require training on your work site, we are available to provide this service in Brisbane or the Sunshine Coast. Major Training Group offers flexible, reliable, and easy to access options that let you learn on the job. Courses start Mondays and Tuesdays and run from 6:30am to 3pm daily. 1-2 days formal training, 1 day practical training & up to 6 months log book on the job. Nationally Recognised Statement of Attainment on successful completion. Quality competency-based training program delivered by our industry leading trainer/assessors. Times: 6:30am to 4pm daily. All requirements of the training are completed in a controlled environment at Major Training Group’s high quality simulated worksites throughout QLD and your employers workplace. Students must log hours and detail of relevant tasks performed at their workplace. Student log book must be signed off by employer or employer’s representative with the relevant OHS licence. Wear steel capped or safety boots on site; sun protection Hat, long sleeved shirt and pants – are also recommended. Want more than a dogging ticket? Get a nationally recognised qualification with our new construction skill program and get a Certificate III in Dogging. This complements our current dogman training perfectly and can take your career to new levels. Contact our Brisbane based team today to start your study in Sunshine Coast or beyond. Kick start your career in the construction industry with a Dogman Licence from Major Training Group. Major Training Group is your genuine training partner and we will help you upskill for the future. Consider upskilling from Dogman with a Rigging course or combine it with a Safe Working at Heights or an Elevated Work Platform course. Whatever your career goals working with high risk plant, Major Training Group will make it happen.